I was home alone this particular evening with a giant turnip sitting in my refrigerator begging to be used from my recent Instacart order. I had big plans of sneaking it into a meal for the loved one but with his work travel requirements this month time was running out. So, without further hesitation I thought to myself, "Let's spiralize this bad boy!" It was a large turnip. I thought maybe I'd half it and make baked turnip chips with the other half like I've made before, but ultimately decided to share the turnip love and take half of the spiralized turnip noodles to my friend/coworker so she could try cooking with them too. I love turnips personally so to me they have a mild flavor anyway. The menu is all Paleo and Whole 30 friendly: Paleo rosemary chicken, Paleo turnip noodle pasta (Aglio et Olio), with Paleo roasted butternut squash. All dishes were prepared for one person, so if you plan to cook for more than one just multiply the serving sizes! Paleo Roasted Butternut Squash: Start this first because it takes longest to cook. This was a basic add in because I had some diced up butternut squash on hand. I sprinkled pink Himalayan salt and dried rosemary on top of and tossed it onto a greased foil lined baking sheet to roast for 20-30 minutes at 350 F. You can vary this up so easily, as well as roast it to your preference. I was hungry so I didn't want to wait longer! Normally I roast things 30-45 minutes depending on the veggie. I had recently purchased organic frozen, cut butternut squash. I will not do that again...consider yourself warned. I could tell it wasn't fresh. Better to spend the extra money to buy fresh, pre-cut or do the hard work yourself to cut one open. Paleo Rosemary Chicken: I am sure it is frustrating when I say I do not measure things sometimes when I cook. I am sorry for that, but I'd be dishonest if I said to use a 1/2 tsp of this and 1/4 tsp of that when truly I didn't measure it. Plus, providing you measurements could result in a different flavor than what I had! However, I do think that this allows you to season to your taste preference. You may like more rosemary or more thyme, etc. so don't be afraid to add a dash more of whatever you like. I used a thin sliced organic chicken breast that I set out until room temperature, then coated it with egg before dredging it through the following flour mixture. Almond flour breading: almond flour, fleur de sal (salt), onion powder, garlic powder, ground thyme, ground sage, and dried rosemary. I baked it for about 15 minutes in the oven at 350 F. I cut into it to make sure there was no pink flesh and then sprinkled more dried rosemary on top of the chicken. Heavenly. Make sure to check the color of the meat to ensure it is done cooking. All ovens vary and it would be ideal if you had a meat thermometer. I do not have one, so the old cut into it to see pinkness trick is all I have going for me. Paleo Turnip Noodle Pasta (Aglio et Olio...sort of): Here's the fun part! Wash and peel your turnip, then cut off the ends to there's a flat surface. 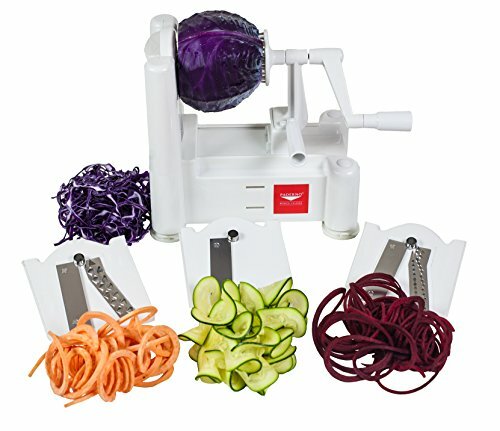 Place your turnip onto the Spiralizer (I used blade C on my 3-blade Spiralizer) and begin to spiralize it into noodles. MAGIC.EVERY.TIME. I used my trusty non stick pan to saute it this time instead of the Copper Chef pan because my 1/2 of the turnip produced an enormous amount of "noodles" that the copper pan could not have held. I started the dish by sauteing onions and fresh garlic in a tiny bit of olive oil. Once the onions become translucent you can add the turnip noodles. I drizzled truffled olive oil over the turnip noodles, then added truffle salt, pink Himalayan salt, dried basil and dried oregano. You can keep adding these seasonings to it if you like more flavor like I do. I just taste test the dish until I like it. And yes, I said TRUFFLED olive oil. It's less expensive than splurging on straight truffle oil but has a nice amount of truffle flavor to it. When everything is finished cooking and you serve yourself a fancy-yet-super-healthy dinner, pour yourself a glass of (very non-Paleo, non-Whole 30 friendly) wine and enjoy the rest of the evening because you have to time to do anything you want because this meal took less than 30 minutes to prep, bake, serve, and clean up. Enjoy!